Grain handling is a high-hazard activity, where workers face serious injury and death. Youth should not be in grain bins or silos or in/around flat storage structures unless they are empty, proper lock-out/tag-out and other safety procedures are followed, and the youth is at least 16 years old. 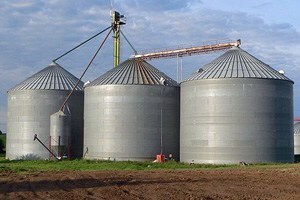 Have you taken the proper steps to ensure the safety of grain bins/silo entry on your farm? Has all mechanical and electrical energy been locked out? Pneumatic equipment locked out? Is there potential for combustible gas, vapors or toxic agents? If yes, has it been tested? Is there potential for the grain to be waist high? If so, has a method(s) been identified to protect workers from the engulfment hazard? If a worker enters, is an observer in communication? Are there dust masks or respirators available? Grain Bin Safety Week is an annual campaign to promote grain bin safety on farms and commercial grain-handling facilities. A collaborative effort with industry leaders and agricultural professionals, Grain Bin Safety Week was created to raise awareness about grain bin dangers, provide education and share best safety practices.